2016 will go down in history as the year where everything went NVIDIA’s way. Last year ended up being a banner year for the company, with NVIDIA’s revenue and profits growing by leaps and bounds to set some very big records. And that outcome is not a fluke; from automotive to datacenter to consumer graphics cards, the company was able to execute almost perfectly, delivering solid products built around their 16nm Pascal architecture. But why do I bring this up in a video card review? In part because NVIDIA needs to follow up what was their greatest year ever, and in part because if it feels like NVIDIA is taking a bit of a victory lap, you wouldn’t be wrong. When NVIDIA launched the GeForce GTX 1080 back in May they set a new high bar for GPU performance, and they never once had to look back. Consequently the last 10 months have been witness to the NVIDIA’s greatest flagship-level performance lead in at least a decade; the high-end video card market and its lucrative profits have belonged to NVIDIA and NVIDIA alone. However that was 2016. We’re now 3 months into 2017 and approaching Pascal’s first birthday, and NVIDIA needs to set the stage for the next year to come. If NVIDIA wants to repeat 2016 then they need to refresh their product lineup to deliver better performance and a better value, to capture the still-significant portion of the PC gaming market still on 28nm-generation architectures like Maxwell, Kepler, and GCN 1.x. And, as the saying goes, there’s no better place to start at than the top. Unveiled last week at GDC and launching tomorrow is the GeForce GTX 1080 Ti. Based on NVIDIA’s GP102 GPU – aka Bigger Pascal – the job of GTX 1080 Ti is to serve as a mid-cycle refresh of the GeForce 10 series. Like the GTX 980 Ti and GTX 780 Ti before it, that means taking advantage of improved manufacturing yields and reduced costs to push out a bigger, more powerful GPU to drive this year’s flagship video card. And, for NVIDIA and their well-executed dominance of the high-end video card market, it’s a chance to run up the score even more. With the GTX 1080 Ti, NVIDIA is aiming for what they’re calling their greatest performance jump yet for a modern Ti product – around 35% on average. This would translate into a sizable upgrade for GeForce GTX 980 Ti owners and others for whom GTX 1080 wasn’t the card they were looking for. We’ll start as always with the GPU at the heart of the card, GP102. With NVIDIA’s business now supporting a dedicated compute GPU – the immense GP100 – GP102 doesn’t qualify for the “Big Pascal” moniker like past iterations have. But make no mistake, GP102 is quite a bit larger than the GP104 GPU at the heart of the GTX 1080, and that translates to a lot more hardware for pushing pixels. GTX 1080 Ti ships with 28 of GP102’s 30 SMs enabled. 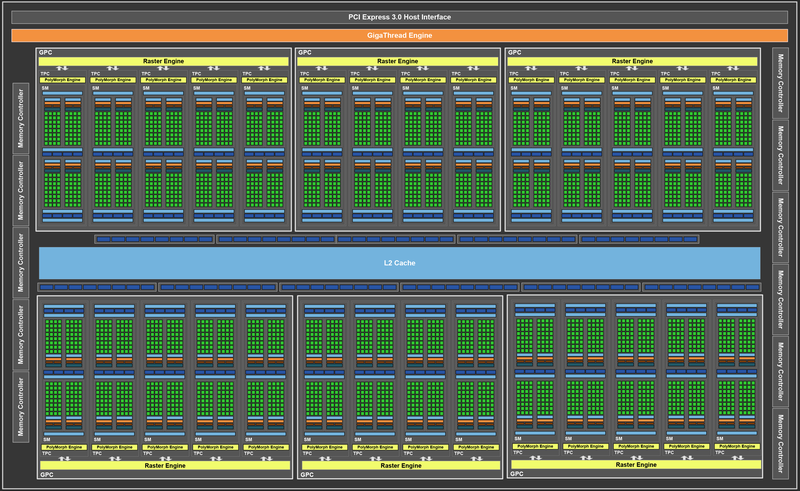 For those of you familiar with the not-quite-consumer NVIDIA Titan X (Pascal), this is the same configuration as that card, and in fact there are a lot of similarities between those two cards. Though for this generation the situation is not going to be cut & dry as in the past; the GTX 1080 Ti is not strictly a subset of the Titan. The big difference on the hardware front is that NVIDIA has stripped GP102 of some of its memory/ROP/L2 capacity, which was fully enabled on the Titan. Of the 96 ROPs we get 88; the last ROP block, its memory controller, and 256KB of L2 cache have been disabled. Otherwise, relative to the current top dog on the GeForce side, GTX 1080, we’re looking at a nearly 40% increase in the number of functional units, which will put the GTX 1080 Ti in its own class. In terms of clockspeeds the GTX 1080 Ti ships with a 1.48GHz base clock and a 1.58GHz boost clock. This is a bit lower than the clocks the GTX 1080 shipped at – 1.6GHz and 1.73GHz respectively – though par for the course for video cards based on these bigger GPUs. Though more importantly, as we’ve seen time and time again with Maxwell and Pascal, the complex nature of NVIDIA’s turbo mechanism means that the average clockspeeds of an NVIIDA card are frequently higher than NVIDIA’s official values, and that means that GTX 1080 Ti is defined more by its performance in the field than its specifications on paper. Meanwhile on the memory front, the GTX 1080 Ti is the first card NVIDIA is equipping with partner Micron’s second-generation GDDR5X memory. This refined design allows for higher clockspeeds, allowing NVIDIA to ship the GTX 1080 Ti with an 11Gbps memory clock, a 10% increase over the 10Gbps clock found on the Titan and the GTX 1080. 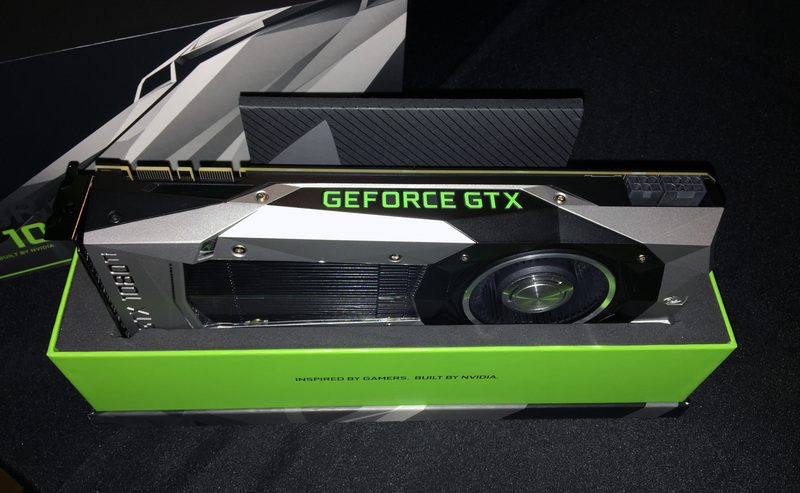 This memory is situated on a cut-down 352-bit memory bus – NVIDIA has disabled the last 32-bit channel in part to differentiate the card from Titan X – which works out to 11GB of memory with a total bandwidth of 484GB/sec for the GTX 1080 Ti. Going by the numbers then, the GTX 1080 Ti offers just over 11.3 TFLOPS of FP32 performance. This puts the expected shader/texture performance of the card 28% ahead of the current GTX 1080, while the ROP throughput advantage stands 26%, and memory bandwidth at a much greater 51.2%. Real-world performance will of course be influenced by a blend of these factors, with memory bandwidth being the real wildcard. Otherwise, relative to the NVIDIA Titan X, the two cards should end up quite close, trading blows now and then. 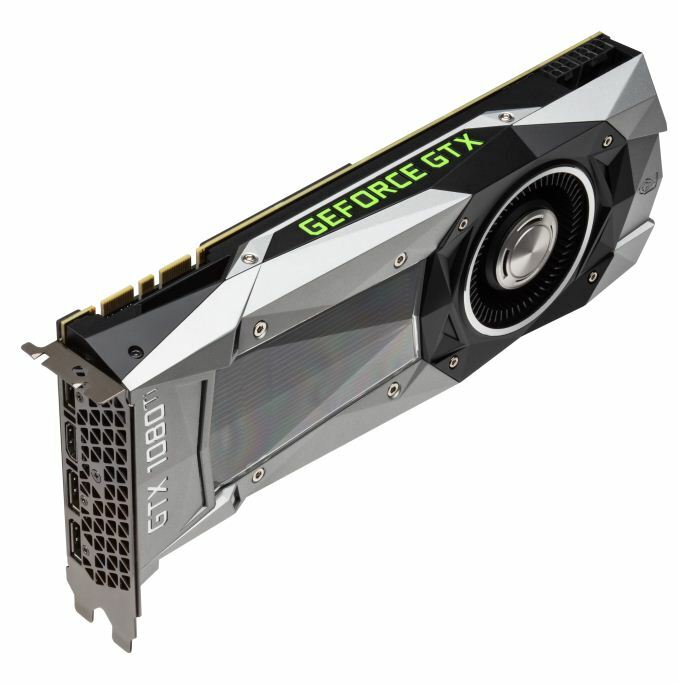 Speaking of the Titan, on an interesting side note, NVIDIA isn’t going to be doing anything to hurt the compute performance of the GTX 1080 Ti to differentiate the card from the Titan, which has proven popular with GPU compute customers. Crucially, this means that the GTX 1080 Ti gets the same 4:1 INT8 performance ratio of the Titan, which is critical to the cards’ high neural networking inference performance. As a result the GTX 1080 Ti actually has slightly greater compute performance (on paper) than the Titan. And NVIDIA has been surprisingly candid in admitting that unless compute customers need the last 1GB of VRAM offered by the Titan, they’re likely going to buy the GTX 1080 Ti instead. Moving on, the card’s 250W TDP should not come as a surprise. This has been NVIDIA’s segment TDP of choice for Titan and Ti cards for a while now, and the GTX 1080 Ti isn’t deviating from that. GTX 1080 Ti isn’t necessarily meant to be more efficient than GTX 1080 – we’re still looking at the same architecture on the same manufacturing node – but instead it’s a more powerful GeForce for those users who are willing to trade power consumption for improved performance. With the specs out of the way, let’s talk about market positioning, pricing, and availability. Like the GTX 1080 before it, NVIDIA is once again going to be working with partners to offer a mix of reference and custom designs. 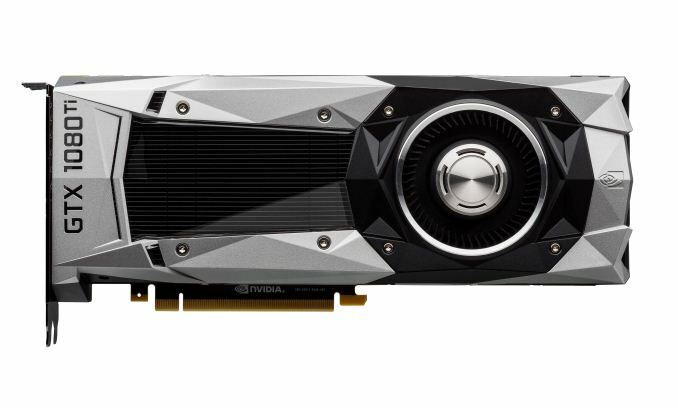 The GTX 1080 Ti will initially be offered in a Founder’s Edition design, while partners are also bringing up their own semi and fully custom designs to be released in April. Importantly however, unlike the GTX 1080 & GTX 1070, NVIDIA has done away with the Founder’s Edition premium for the GTX 1080 Ti. The MSRP of the card will be the MSRP for both the Founder’s Edition and partners’ custom cards. This makes pricing more consistent, though I’m curious to see how this plays out with partners, as they benefitted from the premium in the form of more attractive pricing for their own cards. As for pricing, with the launch of the GeForce GTX 1080 Ti, NVIDIA and their partners are shuffling their product stacks to accommodate the new card. The GTX 1080 Ti is being priced at $699, which was the original launch price for the GeForce GTX 1080 Founder’s Edition. The GTX 1080 has in turn received a price cut, with the base cards going down to $499, and the Founder’s Edition going down to $549. For better or worse this $699 price tag does work out to being a bit of a price hike over the GeForce GTX 980 Ti – it launched at $649 two years ago – but at the same time it's still more aggressive than I had been expecting given the GTX 1080's launch price last year. The GTX 1080 Ti will be launching tomorrow, with today’s review embargo designed to whet your appetite (and perhaps open up your wallet). NVIDIA and their partners will be selling the Founder’s Edition cards for the launch, so while it’s likely that the first shipment will sell out, everyone should have their usual choice of tier 1 retailers. Meanwhile in a bit of news that didn’t get disclosed at GDC, NVIDIA is including the GTX 1080 Ti in their latest Prepare for Battle game bundle, an unexpected move given that NVIDIA has shied away from launch bundles on high-end cards in recent years. Under NVIDIA’s latest bundle program, buyers will qualify for a free copy of either Ubisoft’s For Honor or Tom Clancy’s Ghost Recon Wildlands, both of which have launched in the last few weeks. Finally, looking at the competitive landscape, there’s not much to say right now. GTX 1080 Ti is NVIDIA’s chance to run up the score even further, giving them a solid 1-2-3 position in the market. GTX 1080 Ti will eventually have to do battle with AMD’s RX Vega video cards sometime in the next quarter, but as that’s still months off and Vega is an unknown in terms of performance, it’s not a factor at this time. For GTX 980 Ti and GTX 780 Ti owners, this is the card NVIDIA would like to sell you as your next upgrade. And if you managed to hold off on buying a GTX 1080 FE last year, then the GTX 1080 Ti is going to bring a lot more performance for the same price. Good question. 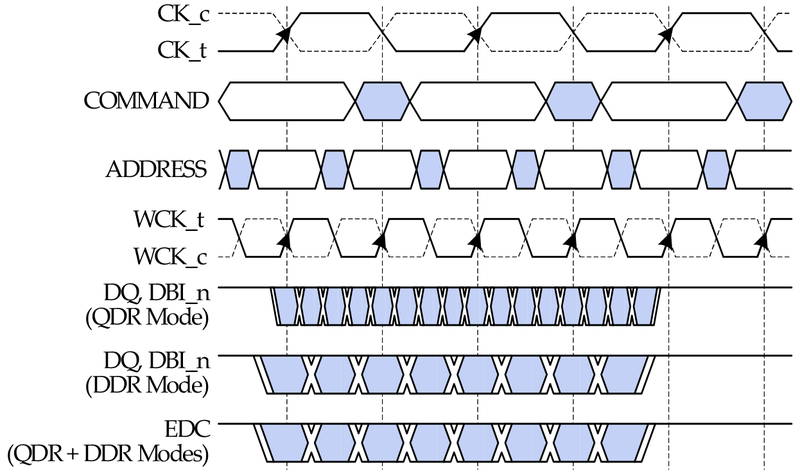 Because of the various clocks within GDDR5(X)*, memory manufacturers prefer that we list the speed as bandwidth per pin instead of frequency. The end result is that the unit is in bps rather than Hz.